Fall’s programs are now in full-gear at Sterling UMC. Our adult discipleship and fellowship opportunities have all re-launched this week with our Growing Deeper at Ten small groups on Sundays and our newly reimagined Wednesday Night Fellowship starting tomorrow September 12. This time of the year offers us all the chance to take part in both church-wide fellowship events as well as smaller groups tailored to our individual needs. Our vision of the discipleship journey here at Sterling UMC consists in encountering God through meaningful worship, being formed through opportunities for education and spiritual growth, and leading our lives as good neighbors in service to our church and community. Each of the aspects – worship, formation, and service – build upon the others and help us each to follow Christ in a more full, vibrant way. By paying attention to all three areas, we can foster a balanced spiritual life and avoid missing out on the ways God might be calling us to respond to grace. The goal of our discipleship ministries, then, is to provide diverse contexts through which we might all have the opportunity to grow. This past Sunday, our adult discipleship groups got off to a great start. Our offerings for people across the spectrum of situations in life help us to ensure that there is a place for everyone going forward. Our young adults’ group will be exploring how we can be witnesses for Christ in the face of those who might doubt the legitimacy of our beliefs. The Grief Workshop is currently nurturing us through the many instances of loss and pain that have affected our church. Our class for relationships is learning about the five love languages in order to discover how we can best love and serve our significant others despite our differences. As SUMC’s new Director of Discipleship, I am especially thrilled to be leading two groups, one on Sunday Mornings – Faith Foundations – and one on Wednesday Nights – Jesus and Everyday Life. Both of these groups help us to dig deeper into our faith and to discern what living the Christian life looks like today. All of these discipleship opportunities and the many more left unmentioned are offered to our church community so that we each have a place to grow every week. Whether you currently feel that you’re on the mountaintop of joy or in the valley of sorrow, the SUMC Discipleship ministries are here for you, ready to walk with you along your path. It is my hope that you find the spot that fits you the best. 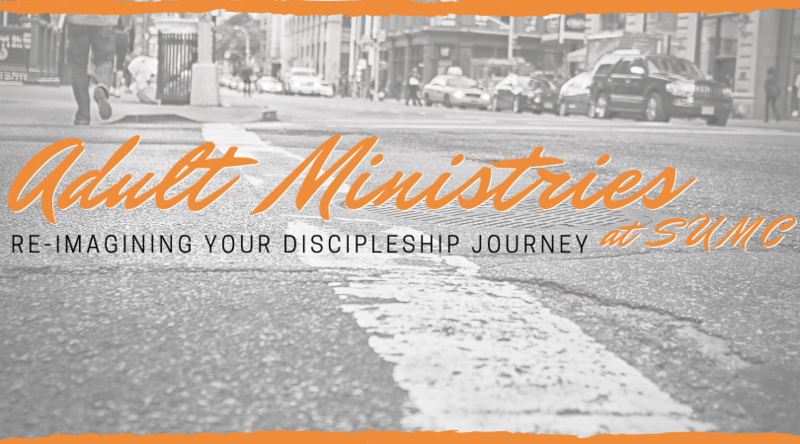 Because the journey of discipleship is never simply an individual effort, I want to extend a special encouragement to us all to continue participating in our worship services, fellowship times, and service opportunities throughout the fall. These help us to come together as a church to meet one another’s needs and grow in our faith alongside a community that inspires each of us along the path of discipleship. So, if you haven’t already, join one of our vibrant small groups on Sunday mornings or participate in our Wednesday Night Fellowship beginning this week. You’ll undoubtedly be glad you did. After all, there’s a place created just for you.